Gorgeous brand new home, 5 bedroom 5.5 bath private home with extra loft room -brand new construction located in the Seacrest Beach Community. Exquisitely decorated with TV’s in all bedrooms and sleeping accommodations for up to 18. The “Ciao Bella” home displays impeccable craftsmanship features such as the gourmet kitchen designed with custom shaker cabinets to the ceiling with glass doors on the upper cabinets, quartz counter tops and Thermador appliances. The spacious living room and dining room are accented with wood walls, hickory floors and wood beams, a fireplace, 60″ flat screen TV and a stupendous kitchen with bar seating for five plus a beautiful dining table with seating for ten. An outdoor lounge area in the front porch also offers a 60″ Smart TV and a gas fireplace allowing guests to comfortably enjoy an “al fresco” dining experience while watching your favorite game or movie. Additional features include floor to ceiling subway tile in all showers and tubs, solid interior doors and custom closets. The first floor offers a King bedroom with private full bathroom and built-in bunk beds for added sleeping accommodations for the kids. Flat screen TV and large closet. Second floor offers a very large Master Suite with King bed, TV, fireplace, and additional built-in bunk beds and a private balcony with great views of the Seacrest beach and Rosemary beach neighborhoods. Two additional King bedrooms with private bathrooms and TV’s are also located in the second level along with a fifth bedroom with Queen size bed, private bathroom and TV. The third floor features a large room for entertaining with TV, pool table, sofa, two sets of built-in bunk beds to sleep 4, a half bathroom and a wet bar (sink and small fridge) and a large wrap around open deck with patio furniture for everyone to enjoy the sunset and ocean breeze. A long driveway on the side of the home easily accommodate three vehicles plus 2 additional spots on the street in front of the home. The community of Seacrest Beach is nestled between Rosemary and Alys Beach and the amenities include a 12,000 square foot waterfall lagoon exclusive community pool, pedestrian sidewalks and complimentary beach shuttle provided to and from the beach. Alongside being located in one of the most coveted communities of Scenic 30-A, the exquisite furnishings, decor, and modern appliances you will find at this home will mesmerize you and make you never want to leave. 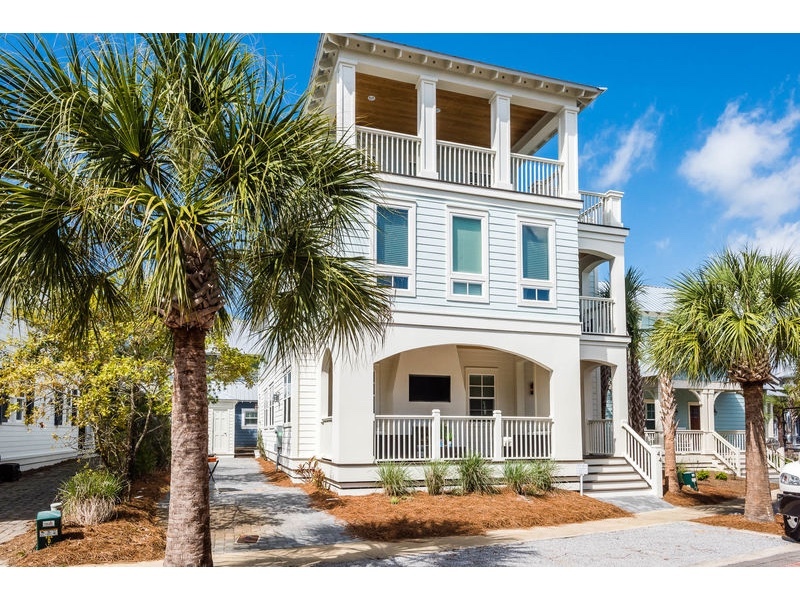 Seacrest Beach is between Rosemary & Alys Beach and is a short 5-10 min drive to Seaside and Watercolor, and approximately 30 minutes to Destin and Panama City Beach.